The members of Konya Bar Association who were detained on 21st July 2016 as the first victim of the systematic crackdown against lawyers within the scope of post-July persecution were sentenced range to 2 and 11 years after 16-month arrest. On 25/10/2017, Konya 6th High Penal Court, sentenced 20 lawyers (including former president of the Konya Bar Association Kayacan) range to 2 and 11 years imprisonment. Fevzi Kayacan, Former President of Konya Bar Association. Mr. Kayacan is under arrest since July of 2016. He resigned from presidency of the bar after got arrested. Lawyers Özlem Gümüştaş and Sezin Uçar from Law Office of the Oppressed were arrested on October 26, 2017, ahead of the next hearing of Suruç trial, regarding the suicide attack killing 33 people in Suruç, Urfa in 2015, where activists, who gathered to deliver toys and humanitarian aid to Kobanê and were issuing a statement for the press, were targeted. Lawyer Gökmen Yeşil, the head of ÇHD’s İstanbul Branch has said that the lawyers are being charged with “propagandizing for a terrorist organization” due to their posts on social media. The names of detained lawyers were given as Nergiz Tuba Aslan, Şule Arslan Hızal, Yemen Cankan, Emel Diril, Dinçer Çalım and Bahattin Özdemir. Also it was reported that detention warrant was issued for Lawyers Alihan Pilaf and Erdogan Akdoğdu. Lawyers SA and HÇG were briefly detained in the province of Isparta, on October 20, 2017. Lawyers were released with probation by Isparta Peace Criminal Judge. 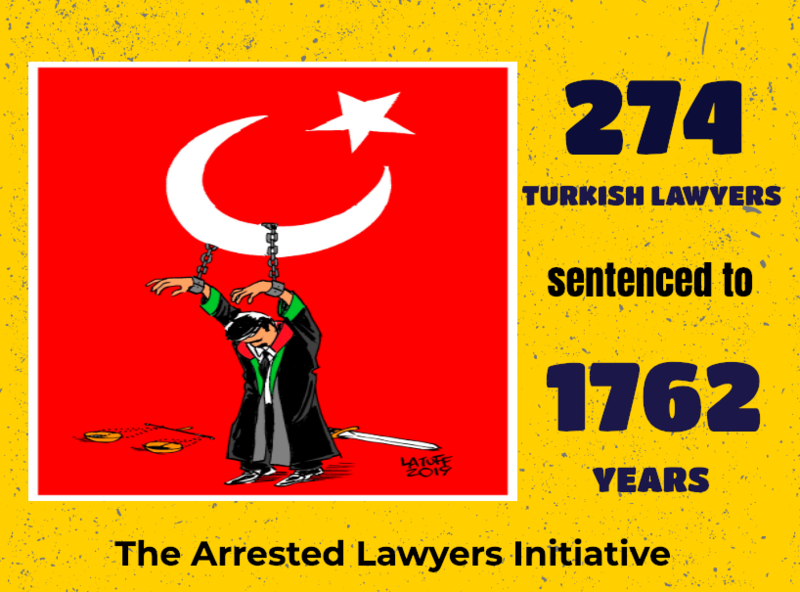 As of today, 555 lawyers have been arrested and 1415 lawyers are under prosecution, 62 lawyers were sentenced to long imprisonment. Some of the arrested lawyers were subjected torture and ill-treatment. In addition to those; Kocaeli, Niğde, Kırşehir High Penal Courts sentenced fellow Turkish lawyers to long imprisonments.